going to solve its problems. object of poverty and victim of terrorism. remarked, said a press release issued by Senate Secretariat. 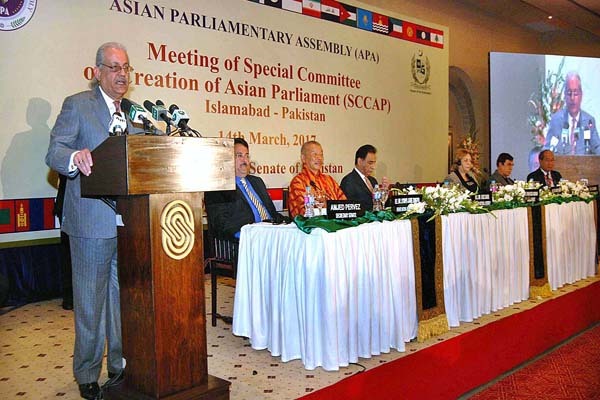 Committee on Political Affairs, Asian Parliamentary Assembly (APA). Pakistan from 13-17 March, 2017 in Islamabad. interests; yet the people of Asia are represented at this forum. resources were exploited by western imperialism. consequences of BREXIT and US Presidential elections. Asian region and it is this threat that Asia come across. Peacekeeping Missions. However, Asia has severe shared challenges. commitment and symbolize unity in sharing our resources.